The macula is the area of the retina providing the sharpest vision, required for reading and face recognition. The events responsible for visual deterioration in Age-related macular degeneration (AMD) are complex and are not completely understood. However it is easy to gauge the stage of retinal pigment epithelium (RPE) and photoreceptor damage from a symptomatic perspective. In the early stages there maybe slight blurring of vision or no symptoms at all. But as the disease advances there is progressive central visual deterioration. In the dry form, the patient reports a gradual reduction in the sharpness, and quality of vision. Other patients may report difficulty in reading or blind spots. In the wet form of AMD, visual loss is also dependant on the size of leakage or bleeding from the choroidal neovascular membrane (CNVM). Objects may seem distorted and straight lines may appear kinked. 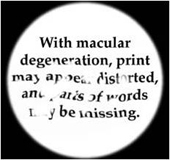 Patients may report missing words or a large central blur when attempting to read. In both forms of AMD, the final stages produce a large central blindspot. Ultimately, peripheral vision remains intact, therefore complete blindness is very rare in AMD.